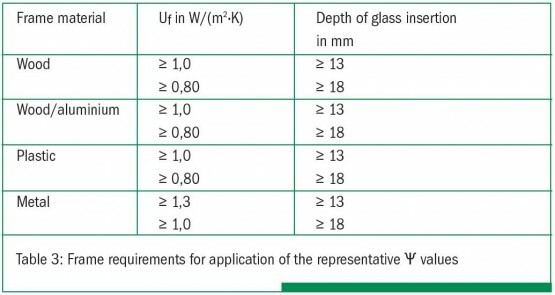 The data sheets ‘Psi-values for windows” of the Working Group Warm Edge of the BF Bundesverband Flachglas (German Federal Flat Glass Association), containing representative Psi-values for windows for thermally improved spacers are suitable for a simplified verification of Uw-values of windows. However, it is not allowed to use them for each and every window, especially not for facades. The application is only possible according to the ift guideline WA-08. For wooden-, wood-aluminium- or PVC-windows for example, the representative Psi-values can only be applied for frame-U-values Uf greater than or equal to 1,0 W/m²K, and for aluminium-windows as far as greater than or equal to Uf ≥ 1,3 W/m²K. A minimum depth of glass insertion into the frame profile of 13 mm is required as well as the fact, that the real frame profiles must be comparable with the representative frame sections shown on the data sheets. The data sheets must not be used for windows with unprotected glass edge. Driven by steadily increasing demand on thermal insulation of building envelopes, window systems are thermally-wise continuously improved. After all, they play a key-role in energy-efficient building. This is only possible if the thermal transmission coefficients not only of the glazing, but of the frame profiles as well are optimized, i.e. reach lower values. The level of thermal insulation of the frame profiles should not differ too much from the excellent U-values of modern triple insulating glass, to avoid problems like condensation to move from the glass surface to frame or reveal. The number of systems with Uf-values below 1,0 W/m²K is growing. The chart shows the relevant requirements on Uf-values for window frame profiles for the application of representative Psi-values. Highly insulating frames must have a depth of glass insertion of minimum 18 mm. The updated ift guideline WA-08/3 is available since February 2015. It can be ordered from the ift Rosenheim online-shop, as pdf-file for download or as a printed copy (here). Moreover, the ift guideline specifies requirements on the thermal transmission coefficient of the glazing, Ug and on the pane thicknesses. For panes thicker than 4 mm, surcharges have to be applied on the representative Psi-values.